The kitchen is the heart of the home, so keeping it tidy means a saner and more organized family life. Especially as school and work get back into full swing, having a tidy eating and cooking space is a must. 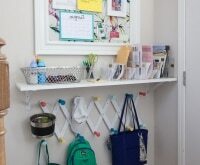 Whether you want to make little tweaks or totally overhaul your storage techniques, you can try out a few or all of these tips to create a more orderly space. 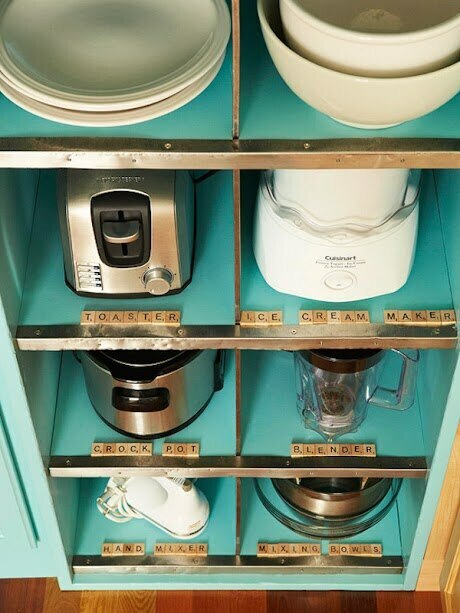 For even more kitchen organization tricks, check out this article. 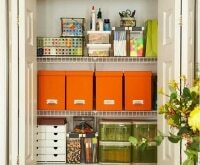 If your whole house needs an organizing overhaul, check out these 9 steps for getting organized — and staying that way! If you’re rounding clutter up in bins and baskets, be sure to shop with a Crate & Barrel coupon or a Container Store promo code to help you save. 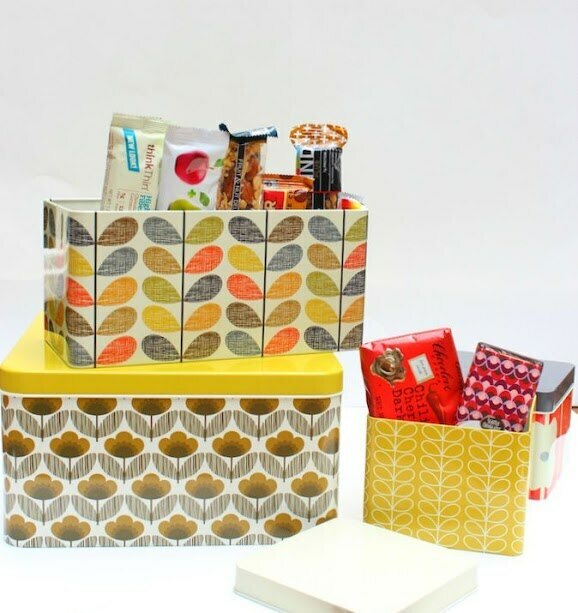 Use tins to store packaged items like chips, crackers, nutrition bars, and even candy and chocolate. You’ll avoid visual clutter with containers that look pretty in your cabinet. Be sure to categorize each tin so you always know where to look. You don’t need a library of cookbooks like the one shown to steal this beautiful organization idea. 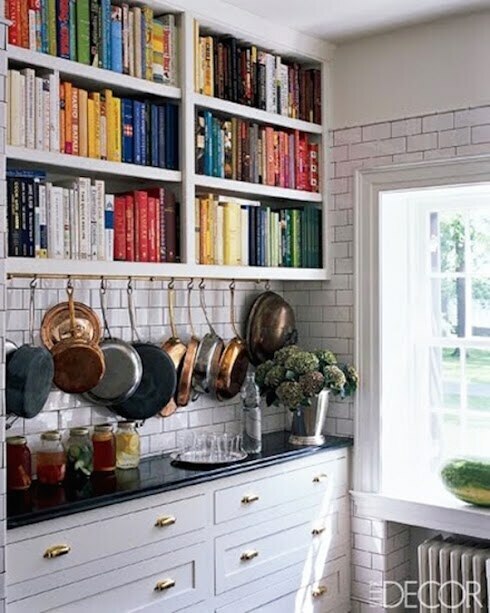 Arrange books by color to create a rainbow in your kitchen, and to make them easier to sort through. Creating uniformity helps keep space tidy and easier to navigate (and avoid waste as a result), so place pantry staples in clearly labeled plastic containers. Keeping spices on a lazy Susan is another clever move. Need more organization inspiration? 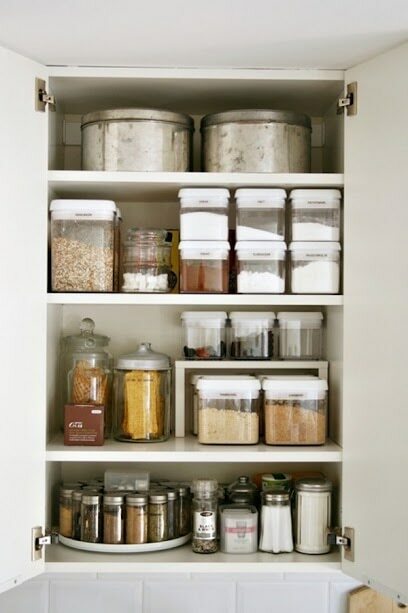 Check out these tips for a double dose of organizing in your pantry and refrigerator! 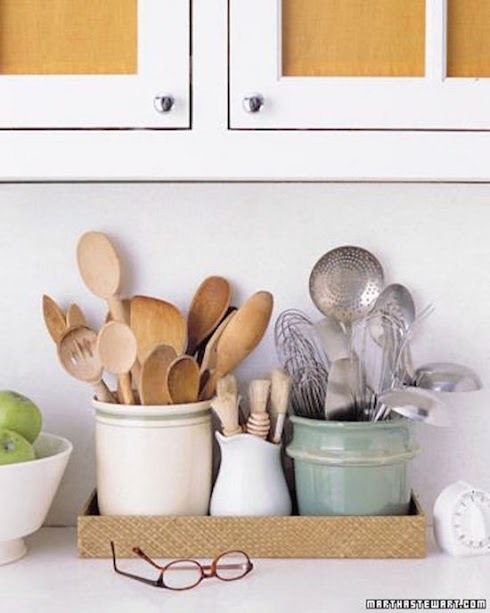 Make more efficient use of drawer space by stashing items diagonally. 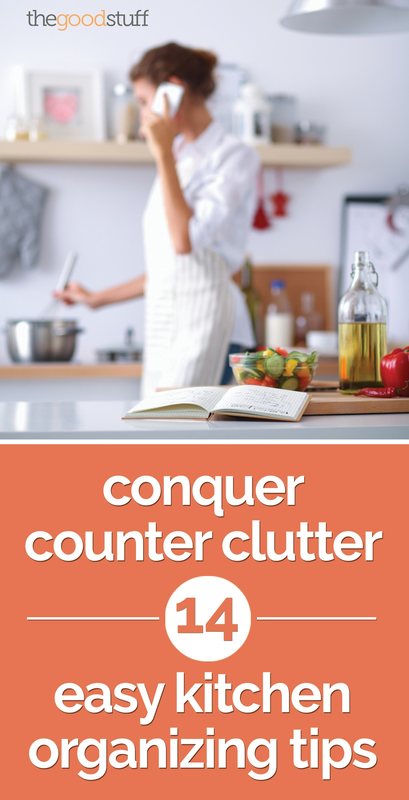 You’ll avoid clutter on your countertop and be able to fit longer utensils more easily. 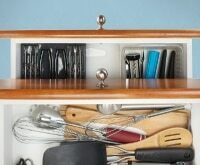 To enhance the organization, designate drawers for certain categories. For example: Measuring tools, cutting tools, etc. 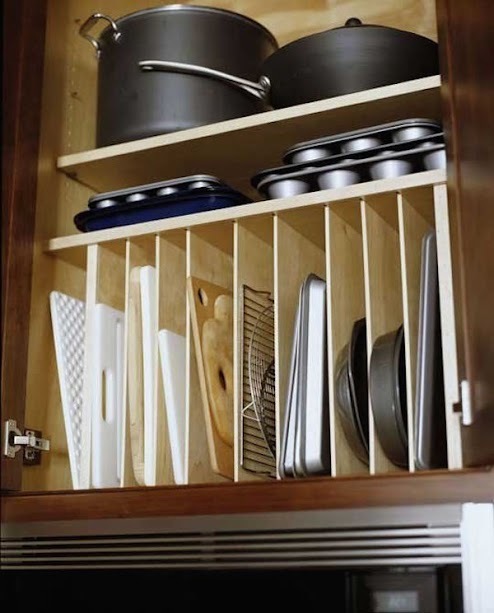 Instead of stacking bakeware, store it vertically using dividers or vertical shelves. It’ll be easier to see what you have and to remove and return pans when you don’t have to wiggle them out from the bottom. You could also include cutting boards. Trays somehow make everything seem neater. Use one to hold cooking utensils, divided between metal and wooden tools in ceramic crocks. 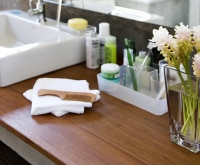 Just be sure to save the countertop for items you use most often so it doesn’t get too crowded. It is possible to tame the craziness under your kitchen sink. 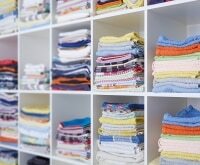 Use small modular drawers to organize items by purpose (cleaners, dishwashing necessities, dish cloths, etc.). 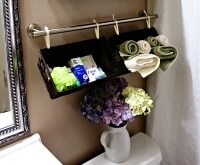 Mount plastic trash bins using command hooks, and use them to hold plastic bags or laundry. The best pots and pans solution really depends on your space and your budget, but this clever metal shelving works for a variety of under-the-range cabinet spaces. 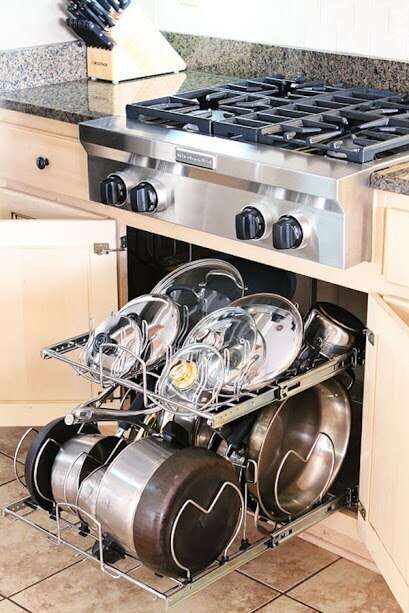 It enables you to easily sort and store pots and pans of all sizes, as well as their lids. There’s always room for more drawers, so instead of stashing table linens in a faraway closet, find discreet space for them in the kitchen. 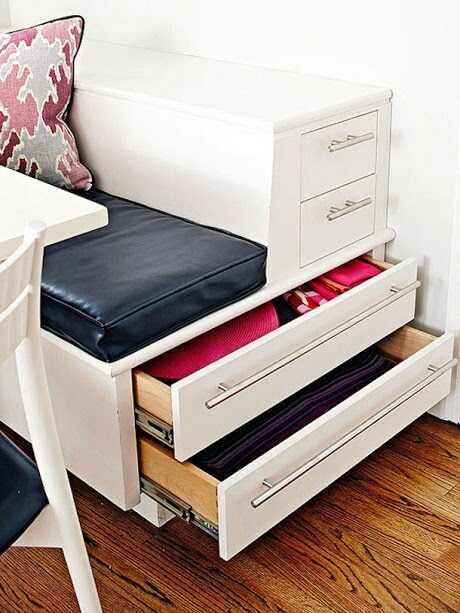 For instance, pull-out drawers under banquette seating create the perfect place to store tablecloths and napkins. Your counter can easily become crowded by dozens of appliances that are infrequently used. Instead, keep them in labeled cubbies, along with their corresponding manuals. 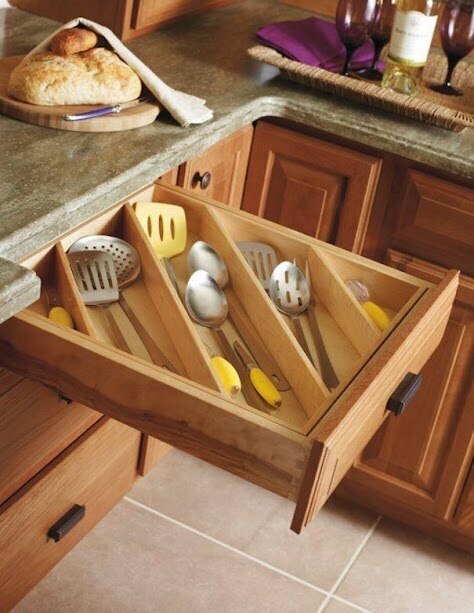 Knife blocks aren’t the only way to store this kitchen essential. 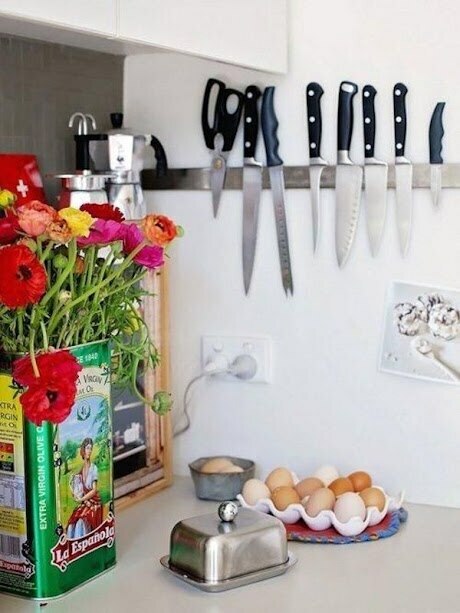 A wall-mounted magnetic strip is perfect for holding knives and scissors, and it’s especially handy if you have a small space with limited counter area. 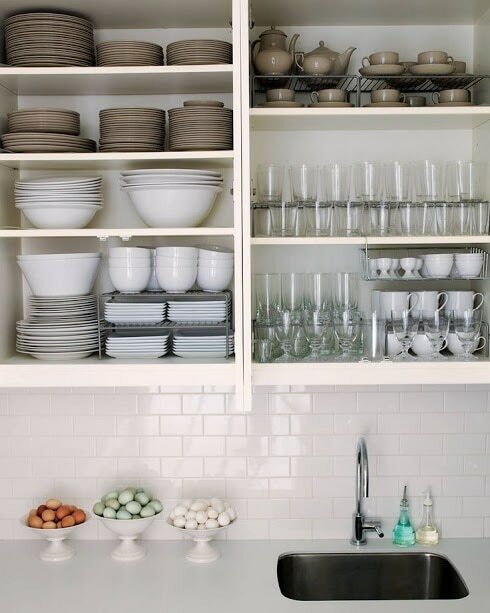 Storing dishes and cups in open shelving will force you to keep them tidy — but that doesn’t have to be hard to do. If you make sure your dishes are of a similar color scheme and group them by item type (salad plates, dinner plates, soup bowls, etc. 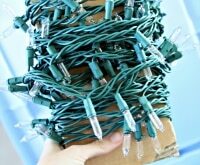 ), they’ll look neat with minimal effort — no special stacking techniques required. 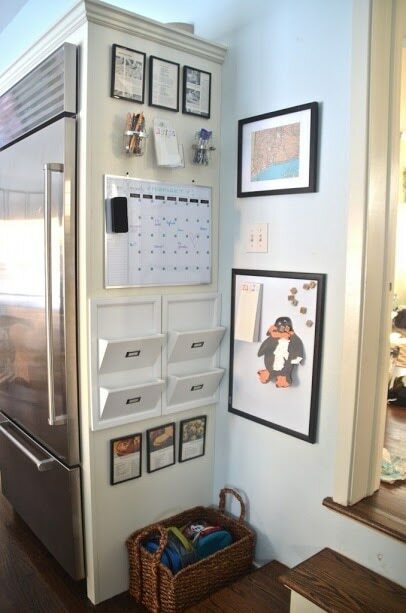 Since the kitchen isn’t just for cooking, turn an otherwise unused side wall into a command center. 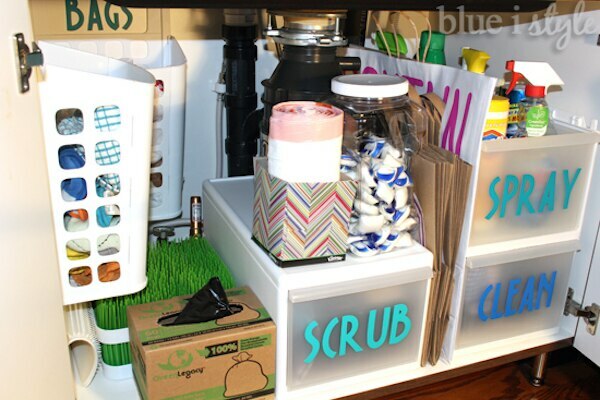 This one includes a dry erase calendar, mason jar utensil holders, mail slots, and a catchall basket for lunchboxes. 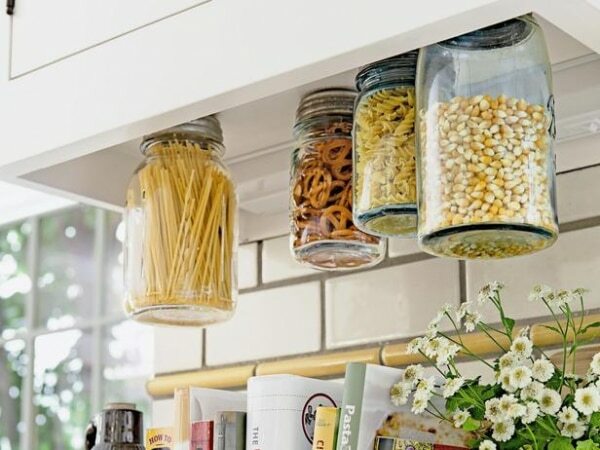 If you have frequently-used pantry items you want to keep close at hand without creating clutter, hanging mason jars are a brilliant storage solution. To make your own, simply glue the tops of jars to the bottom of an upper cabinet. 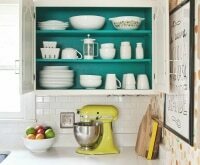 When it comes to home organization, the kitchen can be one of the most daunting rooms to tackle. 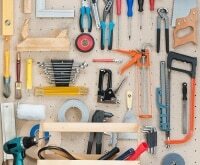 But you don’t have to renovate to create an organized and sanity-saving space! These simple tweaks and clever techniques will make a big difference.